Solnit’s lucid work offers an affirmative case for hope by tracing a history of activism and social change over the past five decades. This excerpt introduces Solnit’s central thesis, that profound and effective political engagement can lead us out of dark times by offering hope for, and the means to bring about, a brighter future. It’s important to say what hope is not: it is not the belief that everything was, is, or will be fine. The evidence is all around us of tremendous suffering and tremendous destruction. The hope I’m interested in is about broad perspectives with specific possibilities, ones that invite or demand that we act. It’s also not a sunny everything-is-getting-better narrative, thought it may be a counter to the everything-is-getting-worse narrative. You could call it an account of complexities and uncertainties, with openings. “Critical thinking without hope is cynicism, but hope without critical thinking is naïveté,” the Bulgarian writer Maria Popova recently remarked. And Patrisse Cullors, one of the founders of Black Lives Matter, early on described the movement’s mission as to “Provide hope and inspiration for collective action to build collective power to achieve collective transformation, rooted in grief and rage but pointed towards vision and dreams.” It’s a statement that acknowledges that grief and hope can coexist. The tremendous human rights achievements — not only in gaining rights but in redefining race, gender, sexuality, embodiment, spirituality, and the idea of the good life — of the past half century have flowered during a time of unprecedented ecological destruction and the rise of innovative new means of exploitation. And the rise of new forms of resistance, including resistance enabled by an elegant understanding of that ecology and new ways for people to communicate and organize, and new and exhilarating alliances across distance and difference. Hope locates itself in the premises that we don’t know what will happen and that in the spaciousness of uncertainty is room to act. When you recognize uncertainty, you recognize that you may be able to influence the outcomes — you alone or you in concert with a few dozen or several million others. Hope is an embrace of the unknown and the unknowable, an alternative to the certainty of both optimists and pessimists. Optimists think it will all be fine without our involvement; pessimists take the opposite position; both excuse themselves from acting. It’s the belief that what we do matters even though how and when it may matter, who and what it may impact, are not things we can know beforehand. We may not, in fact, know them afterward either, but they matter all the same, and history is full of people whose influence was most powerful after they were gone. There are major movements that failed to achieve their goals; there are also comparatively small gestures that mushroomed into successful revolutions. The self-immolation of impoverished, police-harassed produce-seller Mohamed Bouazizi on December 17, 2010, in Tunisia was the spark that lit a revolution in his country and then across northern Africa and other parts of the Arab world in 2011. And though the civil war in Syria and the counterrevolutions after Egypt’s extraordinary uprising might be what most remember, Tunisia’s “jasmine revolution” toppled a dictator and led to peaceful elections in that country in 2014. Whatever else the Arab Spring was, it’s an extraordinary example of how unpredictable change is and how potent popular power can be. And five years on, it’s too soon to draw conclusions about what it all meant. You can tell the genesis story of the Arab Spring other ways. The quiet organizing going on in the shadows beforehand matters. So does the comic book about Martin Luther King and civil disobedience that was translated into Arabic and widely distributed in Egypt shortly before the Arab Spring. You can tell of King’s civil disobedience tactics being inspired by Gandhi’s tactics, and Gandhi’s inspired by Tolstoy and the radical acts of noncooperation and sabotage of British women suffragists. So the threads of ideas weave around the world and through the decades and centuries. There’s another lineage for the Arab Spring in hip-hop, the African American music that’s become a global medium for dissent and outrage; Tunisian hip-hop artist El Général was, along with Bouazizi, an instigator of the uprising, and other musicians played roles in articulating the outrage and inspiring the crowds. Mushroomed: after a rain mushrooms appear on the surface of the earth as if from nowhere. Many do so from a sometimes vast underground fungus that remains invisible and largely unknown. What we call mushrooms mycologists call the fruiting body of the larger, less visible fungus. Uprisings and revolutions are often considered to be spontaneous, but less visible long-term organizing and groundwork —or underground work —often laid the foundation. Changes in ideas and values also result from work done by writers, scholars, public intellectuals, social activists, and participants in social media. It seems insignificant or peripheral until very different outcomes emerge from transformed assumptions about who and what matters, who should be heard and believed, who has rights. Ideas at first considered outrageous or ridiculous or extreme gradually become what people think they’ve always believed. How the transformation happened is rarely remembered, in part because it’s compromising: it recalls the mainstream, when the mainstream was, say, rabidly homophobic or racist in a way it no longer is; and it recalls that power comes from the shadows and the margins, that our hope is in the dark around the edges, not the limelight of center stage. Our hope and often our power. 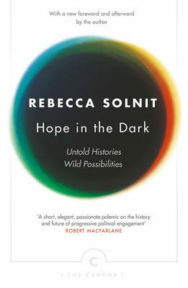 Hope In The Dark by Rebecca Solnit is out now published by Canongate Books priced £8.99.